Many of our deals are not available on our website. For regional departures, different travel dates or a quote on a specific airline or hotel please call our experts who will find the right deal for you at the best price. Our opening hours are Mon-Fri: 9am-7pm, Sat-Sun: 9am-6pm. 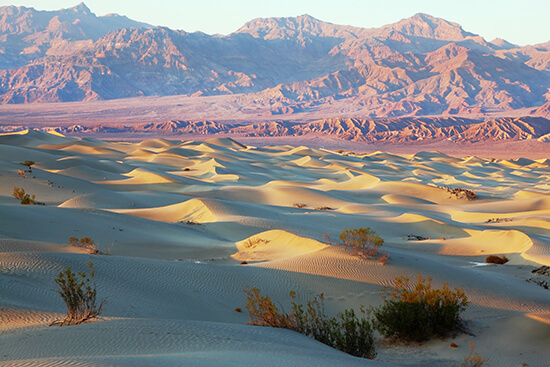 Straddling the diverse US states of California and Nevada, it’s no wonder Death Valley is a land of extremes. It’s best known for being the hottest place on earth – the highest official recorded air temperature (56ᵒC) was recorded here in 1913 – which you should undoubtedly prepare for on a road trip: choose a car with good air conditioning and any seat material that’s not leather. That said, it also has an abundance of wildlife, not to mention a stark contrast of weather in the winter months. 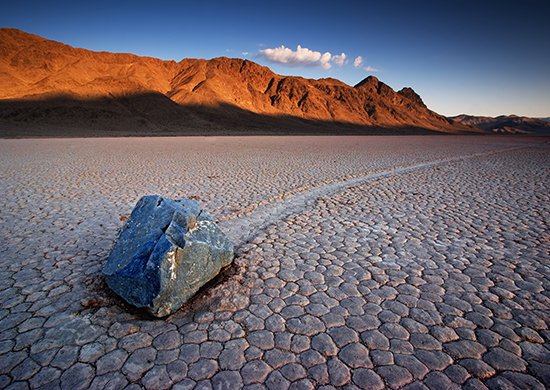 This mysterious dry lake or ‘playa’ near Cottonwood is home to the world-famous sailing stones. These heavy stones are unique in their ability to seemingly move across flat desert landscapes of their own volition, leaving a slither of dusty mud in their wake. Scientists have recently proven that the previously unexplainable movements are actually down to the formation of ‘windowpane’ sheets of ice, frozen during cold water nights before melting into large floating panels on sunny days, dragging the rocks forward. We still like to think there’s a bit of magic involved somewhere, though. If you’re seeking a Death Valley sunrise spot, this is it. Arrive early, and watch as shades of orange, red and gold illuminate the vastness of this national park. You can drive to the viewpoint car park, and from there it’s just a five-minute hike to the perfect lookout, 1,524m above sea level. As for epic sunsets, look no further than the best-known sand dunes in the park. The mountains and dunes here flit from pink to blue as the sun sinks below the horizon, giving the impression that you’re in some far-flung African desert, or perhaps featuring in the latest instalment of Star Wars. But the soft dancing shadows of Mesquite are much more accessible than a movie set, just a 30-minute drive from Furnace Creek. So what’s Furnace Creek you ask? 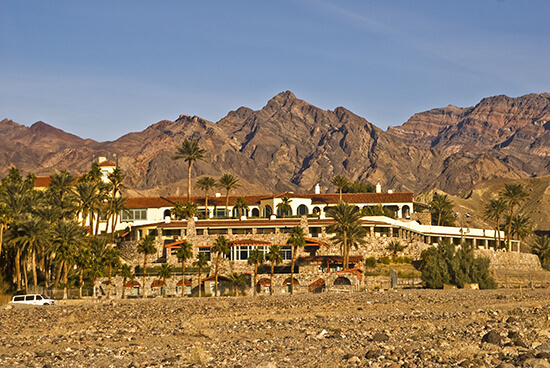 This village features on our list of things to see here, as it’s where Death Valley’s main business happens. Here you’ll find the park’s visitor centre, museum, headquarters and some of the best hotels, making it a great spot to base yourself when you’re not busy exploring. 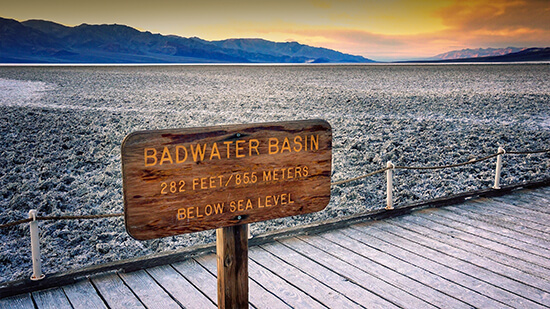 At 86m below sea level, the saltwater flats at Badwater Basin make up the lowest spot in North America. Salt flats and puddles converge into a crunchy, white expanse of water and salt, almost blinding in the sunshine. Afternoons here are best spent at the nearby Artist’s Drive, which stretches for miles of hill-hugging tarmac and – compared to the stark white of the salt flats – offers an explosion of colour. Stay after dark to see why Death Valley has earnt ‘Gold Tier’ international dark sky status. 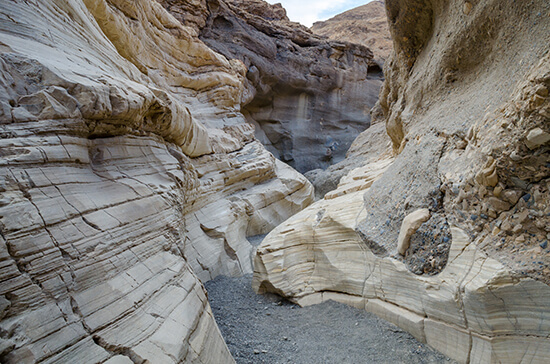 Secluded wonders like Mosaic Canyon are what make Death Valley so appealing. Formed by erosive flash flooding, the narrow and steep walls of Mosaic really are a sight to behold – meandering swathes of polished rock, reaching for the sky. Gazing up from the canyon floor, with not another tourist in sight – that’s when you really start to feel like a pioneer here. 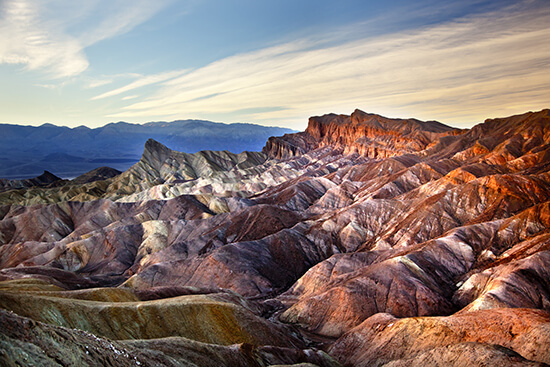 Easily one of the most famous lookouts in the entire park, Zabriskie Point takes in miles and miles of undulating landscape: a postcard-perfect vista of colourful hills, pockmarked by muddy mountains. There are plenty of hikes here too – the one towards Golden Canyon is particularly beautiful – but the real draw is the chance to soak up the sheer scale of this vast park. 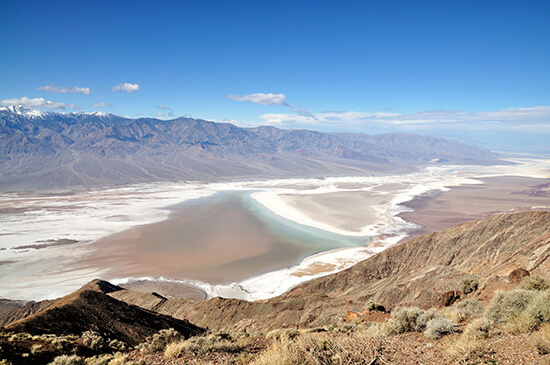 Discover Death Valley on our tailor-made California & Canyons itinerary. Or for more USA holidays, make an appointment with one of our Travel Experts. Once a roving local news reporter and now a travel-obsessed writer/sub, I'm head-over-heels for nature, wildlife and the ocean. When I'm not getting up close to animals and sea creatures, I'm seeking out the sets of my favourite TV shows around the world. Follow me @wonderg1rl89. We'd love to send you our latest holiday offers and travel inspiration by email. To sign up, please enter your details below. We're passionate about travel and want to inspire you, however, you have the right to withdraw your consent from marketing communications at any time. * 0800 calls are free for landlines and mobiles. 0333 calls are included within inclusive minutes package on mobiles, otherwise standard rates apply. 0844/0845 calls are 7p/pm plus your local carrier charge.